a word of advice: you may want to read my articles about “the philosophical renaissance in italy” and “the occult renaissance” first to put things in a wider perspective and for background information. also i have more articles about the jewish kabbalah which you may want to read first. Never had I consulted so much literature for one article. First I thought that there was hardly any information about the Christian Cabala, but digging deeper I found out that there is quite some literature about the subject. Often as a (small) part of another investigation (such as Renaissance magic or Jewish Kabbala) but also as a separate subject. Unfortunately these books are not always too good and mostly virtually unavailable. Most literature I had to get from different libraries throughout the country and of course the Bibliotheca Philosophica Hermetica in Amsterdam. At the bottom of this article you will find titles that I used and which you may want to look for. Often like with the Christian Cabalists themselves, older investigations are copied with mistakes and everything, but sometimes investigators of the Christian Cabala came to very different conclusions. My aim for this article is to give you a general idea of the history of the Christian Cabala separately and combined with that of the Jewish Kabbala and their mutual influences; and to compare some ideas from both traditions to give you an idea of where the differences and similarities are. Asterixes refer to the bibliography below, under *further*reading*. Also I give alternative writings of names of people that I mention. It doesn’t look too great, but it will help you a lot when you start your own searches. Of course I can’t start to speak of the Christian Cabala when you have no information about the original version. A short article within these pages may be helpful and also the longer one about the Tree of Life (Etz Chayyim). Maybe some book reviews can be helpful as well. Here follows a very short account to refresh you memory and/or to introduce you to the world of Jewish mysticism. The word “Kabbala” means “tradition” and in Hebrew contains of three letters (normally from right to left) KBL (kaf, bet, lamed). I have the idea that the spelling can differ in time and context and sometimes it is QBL (qof, bet, lamed), but so far I haven’t seen a text in Hebrew with the actual word really in it. Ancient Hebrew had no vowels so it is hard to fill them in sometimes. 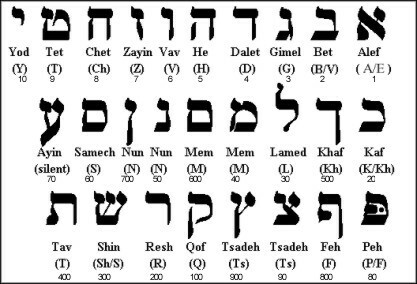 Also the transliteration of letters is different, others will tell you that it is caf, bet, lamed, so you can imagine that ancient Hebrew words are written differently. This is the reason that you often see “Kabballah”, “Kabbalah”, “Cabala”, Qabbalah or whatever variety you can think off. The most common way of writing is “Kabbala”. Early Christian Cabalists usually wrote “Cabala” which is the reason that many people took over this manner of writing to keep the Jewish “Kabbala” from the Christian “Cabala”. Also there is also the magical (Crowleyan) “Qabbala”. The Jewish Kabbala -very bluntly put- is the result of two mystic traditions, the ‘Mercavah’ (chariot) and ‘Hechaloth’ (hallway) traditions that developed towards the Kabbala from the 3rd century on. ‘Mercavah’ comes from the chariot in Esechiels vision and the ‘Hechaloth’ are the hallways that the mystic has to pass on his/her way ‘up’. Kabbala came to flourish especially in Spain in the late Middle Ages en the early Renaissance and in time two kinds of Kabbala developped, the practical and theoretical, or magical and mystical if you like. The Kabbalists focus on the sacred Hebrew books of the Torah, also called Pentateuch which are the five books of Moses and thus the first five books of our Old Testament. These date from ancient times and contain instructions for daily life. The study of these books resulted in the Talmud which means ‘study’ or ‘instructions’. There is a Palestine Talmud dating from the 3rd or 4th century and a Babylonian Talmud written in the 5th century. The Talmud falls apart in two books, first the Mishnah (‘repetition’ or teachings about the Torah) and second Gemarah (or ‘expansion’, an explanation of the Mishnah). Then in the 3rd to 6th century we get the first writing that would be regarded as a Kabbalistic, the well known Sepher Yetsirah or ‘book of formation’. Another well-known Kabbalistic text is the Sepher ha-Zohar or the ‘book of splendour’ which first circulated around 1280 and nowadays it is generally thought that it was written by Moses de Leon (1240-1305), but is said to go back to the teachings of the 2nd century Shimon bar Yochai (135-170). Kabbalism kept developing also in the time that Renaissance eclectics started to form a Christian version of it. Two people that I have to mention in this development are Moses ben Josef Cordovero (1522-1570) and Isaac ben Solomon Luria (1534-1572). As a matter of fact these two late-Kabbalistic figures were the originators of the two major Kabbalistic schools of today. The first worked mostly on the intellectual level and worked out the speculative Kabbala to an understandable system. Luria was more of a mystic. Cordovero’s major work is the Pardes Rimmonim (‘a garden of pomegranates’ – 1591) and his major teachings involve the four levels of understanding the Zohar. 1) Literal; 2) figurative; 3) moral and 4) esoteric/mystical. Luria was the one developing the doctrines of ‘tsimtsum’ (or ‘zimzum’) or God’s withdrawal from creation. 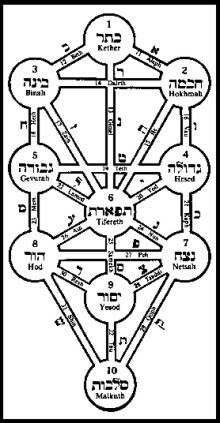 This idea was later developed to the idea of the ‘breaking vessels’ or how the upper sephira of the Kabbalistic Tree (Kether) breaks and flows over into the second two, which break, etc. It must be noted that Luria wasn’t much of a writer and his teachings mostly found their ways into the world by his students, especially Hayim ben Josef Vital (Chayim, Hayyim – 1542-1620). These scratches of information should be just about enough information to continue with the Christian Cabala. As early as the 13th century Raymund (or Raymundus, Raimundus, Ramon) Martini (1220-±1284) wrote in his Pugio Fidei (‘dagger of faith’ – completed after 1278, but not published until 1651) that the Talmud and Midrash (a more ‘literary’ version of the Mishnah) had Christian influences and argued that this fact could be used as Christian propaganda to try to convert Jews. This very idea would become one of the main reasons for Christian Cabalists to study the Jewish tradition a few centuries later. The well-known Kabbalist Abraham ben Samuel Abulafia (1240-1292) was the one who systemised the jungle of Jewish letter/word-games and already made ‘Christian’ word plays that would later become popular under Christian Cabalists. I will come back to this later. The first Jew to be really converted to Christianity was Abner of Burgos (1270-1348) who became Alfonso of Valladolid in 1320. Strangely enough he had visions of shifting around letters like Abulafia had. In the time that Pico was born, many Jews lived in Europe under the tolerant reign of the Muslims. Especially Spain and southern France were crowded with Jews living together with Christians and Muslims. This resulted in fertile crossbreeds. Not for nothing the major Kabbalistic books were written in Spain in this period. When Christians started to win back territory from the Muslims, times got more difficult for the Jews as well. The idea rose that when Muslims were removed anyway, why not kick out the Jews within the same operation (they were -according to Christians- not only heretics, but also responsible for the plague!)? This process was going on in Pico’s early years. Jews were driven away from different places from 1477 on until the big expulsion from Spain in 1492. However many Jews indeed did leave, others thought of another solution: conversion to Christianity. This way they could stay were they were, study Jewish writings as sources of the Christian faith and most of all, continue their Kabbalistic studies (in secret). A very strange thing is that on one hand Jews were kicked out of the major cities all over Europe, but on the other hand there was an interest in Jewish scriptures upto extraordinary high ranks in the Christian hierarchy. It is said that no other than pope Sixtus IV (1414-1484) ordered for translations of Kabbalistic books and most of them are still in the Vatican library until the present day! The translations were made by the Jewish convert Samuel ben Nissim Abulfarash (1226-1286) who after his conversion named himself Gugliem Raimundo Moncada, but is best known under the name Flavius Mithridates. Mithridates told the pope that with the Kabbala he could prove the Christian truths. The same man was the Jewish friend that taught Pico the Hebrew and Chaldean languages. He translated many Kabbalistic and non-Kabbalistic works for Pico and Scholem argues (*Dan | p.20) that the translations in the Vatican library were not made for Sixtus, but for Pico himself! Mithridates (whose father was already a translator of Hebrew books) was Pico’s main source of Jewish writings and Pico didn’t receive the most common Kabbalistic books either! The best-known Kabbalist whose writings Pico read were those of the earlier mentioned Abulafia. Non-Kabbalistic writings that Mithridates translated for Pico include the Bible-commentaries of Menahem Recanati (late 13th to early 14th century). Because there were not that many more texts that Pico read, Joseph Blau* (1909-1986) states that Pico’s knowledge of Kabbala was extremely limited. In a way this may be true, but Philip Beitchman* and Scholem* prove at least a bit otherwise. Mithridates also introduced Pico to the Sepher ha-Bahir (‘book of brightness’) for example, which Pico is said to have studied in Hebrew. Bahir is a strange Kabbalistic work from the Provence from after 1150. The book became important in the Christian Cabala because it forms the link between the Jewish esoteric tradition and neoplatonism and gnosticism. It is formed of various ancient Kabbalistic texts and introduced Kabbalists to the idea of ‘gilgul’ or reincarnation. Another teacher of Pico’s was still a Jewish Kabbalist in the time the two met: Yahonan Alemanno who the Jewish scholar Josef Perles (1835-1894) saw as the most probable person for Pico’s mysterious teacher Dattilo or Dattylus, who wrote a lot about magic, but published only one book. Dattilo based himself on the Kabbalist with many names who is best known for his commentary on the Sepher Yetsirah: Josef ben Shalom Ashkenazi alias Josef the Tall alias Abraham ben David of Posquières alias Rabad (±1125-1198). The last big influence of Pico that I want to mention is Paulus (or Pablo) de Heredia (1408-1486). De Heredia was a convert who had the very irritating habit that Christians seem to have had for a few centuries already: falsifying Jewish texts and using these forgeries as arguments. However Mithridates and Pico’s other teachers probably mentioned this fact to him it seems that the writings of De Heredia had quite an influence on the thinking of the young Pico who may or may not have known him personally. But not only Kabbalist writings were regarded valuable. As we saw before Pico also had translations of non-Kabbalistic Jewish literature. Mithridates also translated works of esoteric theological Jewish writers such as Rabbi Judah ben Samuel He-Chasid of Regensburg (‘the Chasid’ – ?-1217) and Rabbi Aleazar ben Judah ben Kalonymus of Worms (±1176-1238). He did this in particular for another fan of these writers Cardinal Egidio (Ægidius) da Viterbi (Viterbo – 1465-1532) and later Reuchlin seems to have had access to Viterbi’s library. Judah and Eleazar wrote a lot about the Talmud and Midrash from which Christian Cabalists also found many quotes in books of Recanati and Josef ben Abraham Gikatilla (or Gikatilia, Gicatila – 1248-1325). They couldn’t tell apart the theological Talmud commentaries from ‘real Kabbala’. This ignorance was one of the bigger differences between Jewish and Christian Kabbalists: the Cabalists had only scatters and had no knowledge of what was from the Talmudic traditions and what from Kabbalistic. This is not entirely true though, Reuchlin -as Hebraist- later in his life tried to used this half-faked ignorance to save as many Jewish books as he could (he was asked which ones should be burned) by saying that some Talmudic works (which were evil in the eyes of the Christians) were Kabbalistic (which were allowed for containing Christian truths). A very interesting subject in the Christian approach to Jewish works is which works were translated in languages that could be read by Christians and when. There were a few people who started to make translations of Jewish writings at a remarkably early time. I of course mentioned Mithridates a few times already, so I won’t bring him up again. It becomes more interesting when we turn to the major Kabbalistic texts. Large sections of the Zohar have been translated by Guillaume Postel (1510-1587) but these were not published during his life. They did circulate as manuscripts and were known to most Christian Cabalists of his time. The Hebrew Zohar itself wasn’t published until 1558 (under protest), but Postel had translated parts of it before that. The same goes for Postel’s translation of the Sepher Yetsirah. This translation was published in 1552 when the Hebrew version had yet to come. Many translations of this short but primary text would follow. An interesting version is the 1642 printing of Jo(h)annes Stephanus Rittangel(us) (1606-1652), which has both the Hebrew text and a Latin translation. Postel’s translation was by far not the first. One “master Isaac” made a translation to Latin as early as 1480 which we will run into a few paragraphs furtheron. Joseph Blau* didn’t think too highly of most Christian Cabalists. An exception was the convert Paul(o) Ricci(o) (Ric(c)ius, originally Paulus Israelita – ±1470-1541). He not only knew a respectable amount of texts, but also the less well-known texts and he was the first to systemise the Christian Cabalist doctrines. Ricci was a fervent translator and his best-known translation is that of the Sha’are Orah of Gikatilla as the well-known Portae Lucis (‘gates of light’ – 1516). The title page of this work had the first depiction of the Kabbalistic tree outside a Jewish text. The work speaks about the gates of understanding which also will be dealt with later. Another convert that knew “his sources’ sources” (*Beitchman | p.49) was Pietro (Colonna) di Galatini (Petro Galatino 1460-1540). As with many Jews later, Cabala caused his conversion to Christianity. To show the Christian truth in Jewish texts he wrote the book De Arcanis Catholicae Veritatis (‘about arcane Catholic truth’- 1518). Herein you can find translations of parts of the Zohar, a summary of a text on the ‘Shema Israel’ prayer by Paulus de Heredia and other important texts. Johannes Pistorius (1546-1608) was one of the councillors of the Hermetic emperor Rudolf II (1552-1612) of Prague. Pistorius’ “Christian Cabalist Bible” the Artis Cabalisticae (1587) contains translations of what he regarded a the most important Cabalist writings: two books of Paul Ricci De Coelesti Agricultura (1514 – a compilation of texts including Portae Lucis); De Verbo Mirifico and De Arte Cabalistica of Reuchlin (see later); the 1480 translation of the Sepher Yetsirah; commentaries of Archangelus (Puteus) de Burgonova (Burgonovo | ?-1571) on Pico’s Cabalistic conclusions (which were in fact written by his teacher Francesco Giorgi(o) (Venetus) (Franciscus Giorgius / Zorzi – 1466-1540) but Archangelus published them after Giorgi’s death under his own name); and more. The best-known compilation of Kabbalistic and Cabalistic texts if of course the Kabbala Denundata (part I 1677, part II 1684) of Christian Knorr von Rosenroth (1636-1689) which came out very late in the Renaissance, but is still regarded as the most important Christian Cabalist book. Its translations include parts of the Zohar (some of the more mysterious parts), the earlier mentioned Pardes Rimmonim of Cordovero, the Sepher ha-Gilgulim (‘book of the transmigration of souls’ – 1684) by Hayim Vital and other translations. Further a dictionary, explaining diagrams and in some editions a text by a friend of Knorr’s: Franciscus Mercurius van Helmont (a.k.a. Peganius – 1577-1644). Of course these are not the only titles that I could mention, but at least you have an idea. Often translations were parts of writings of Christian Cabalists which I will turn to shortly now. Christian Cabalists saw Christian truths in the Jewish doctrines, especially that of the Kabbala. They started to look for similarities, information that they could use and since it proved that there were Jews who followed the path via Kabbala to Christianity, soon the idea rose that Cabala may be a very good way to convert Jews. So then effort was made to prove that Christianity exists in Jewish texts and that (therefore) Christianity is the follower-up and improvement of Judaism. All this without losing the respect for Judaism itself by the way. The first Christian Cabalist Pico didn’t write a whole lot of Cabalistic texts. His well-known 900 conclusions that he wanted to defend before the church, contain 47 Cabalist conclusions and the 72 derivative theorems thereof. The first 47 are quotes from a variety of works and the 72 are Pico’s own theories based on the quotes. These conclusions were fanatically copied and explained by followers of Pico, but seldom with much originality or new ideas. Pico’s other main Cabalistic work is his Heptaplus (‘more than seven’? – 1489) which Blau calls a “hardly Cabalistic account of creation.” (*Blau | p.28), but which definitely has a Cabalistic content as we will see later. Shortly after Pico followed John Reuchlin who travelled to Florence to meet Pico. Their meeting was short and formal, but the two had a lot of ideas incommon. Reuchlin saw Cabala as “paradisal knowledge that was lost after the fall but [which] could be divined, if not regained, through quiet contemplation on the Hebrew letters, self-absorption and the love of God” (*Dan | p.134). He wrote two Cabalistic books. The first was published in 1494 and called De Verbo Mirifico (‘about the wonder-working word’). It is written in the form of a discussion. At the time of publishing Reuchlin wasn’t much of an expert in Kabbala and Blau even calls him “a beginner rushing to print” (*Blau | p.49). Still the book has its values and is interesting for some of the ideas that would become important in the Christian Cabala. The most eye-catching thing is the play with the tetragrammaton. This term literally means “four-letter-word” and is written thus: YHVH. It is usually either given as “Jahwe” or “Jehova”, but in fact unpronounceable, or better said, the original pronunciation has been lost. The best way to refer to it is to call it the ‘tetragrammaton’, which means ‘four-letter-word’. In his book Reuchlin divides history in three parts like in the Talmud: First there was the age of the patriarchs or of nature (‘tohu’ or chaos in the Talmud) and the three-letter name of God (ShDY or Shaddai). Then there was the age of the Old Testament (the Talmudic age of the law or Torah) and the tetragrammaton YHVH. Thirdly was the age of the New Testament (of the Messiah or of bliss) and the complete name of God (YHShVH). Thus forming the wonder-working ‘pentagrammaton’ (five-letter word) that can be written “Joshua” or Jesus Christ. The latter, Reuchlin described as the first creation, the Logos, to be represented by the highest sephiroth Kether. Further the Verbo says that Hebrew is the original language in which God spoke with men and that it therefore has magical powers, especially when rendering names of God. The book isn’t too penetrating and contains some obvious mistakes. I doubt Reuchlin will have forgiven himself for giving an incorrect sephirothic tree. 20 Years passed before Reuchlin wrote his next Kabbalistic work De Arte Cabalistica (1517). In this time he became ‘Hebraist’, expert in the language and culture of the Jews. He wrote as first non-Jew a (not too good) book on Jewish grammar (Rudimenta Hebraica – 1506) and was asked his opinion about Jewish texts when the Jews had fallen from grace. He read a lot of Kabbalistic works, but to Blau’s* opinion he puts too much stress on Gikatilla. Whereas De Verbo Mirifico was plainly to convey information, in De Arte Cabalistica Reuchlin tried to interweave the Jewish concept that language itself is divine. Here for he comes with more ‘serious’ Jewish word games than before. De Arte Cabalistica is again a discussion, this time between a Cabalist, a Pythagorean and a Muslim. As we saw earlier, Reuchlin saw two traditions particularly as the source and truth of Christianity, one of which is the Cabala, a “sublimated form of alchemy”, the other the Greek classical philosophy. The Arte was written after the controversies and at the time of the burning of Jewish texts. Reuchlin tried to prove their Christian content, to prevent further losses. Both the Jews and the Christians had their four elements, also Kabbalists follow Aristotle (384-322BC) and practise mathematics. Furtheron Reuchlin distincts natural philosophy (‘opus Bereshit’) from spiritual science (‘opus Mercavah’) working respectively on the intellectual and sensible planes and there you have two worlds are higher than our earth. Another thing that would become popular is turning the Jewish expectation of the Messiah in such a way that He has already come in the halfgod Jesus Christ. Greek philosophy is compared to the Cabala, a good example of this comes from another writer. Giorgi said that Aristotle’s 10 categories can be identified with the sephiroth. Reuchlin also explains some typically Kabbalistic concepts which made his book an introduction for Latin readers. 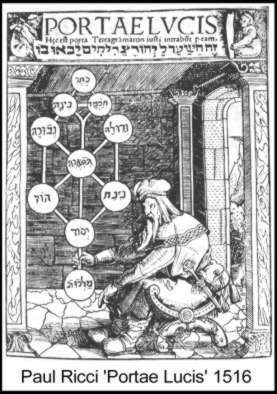 First the idea of the Kabbalistic tree. This tree has 10 sephiroth and 22 ‘paths of wisdom’, the connections between the sephiroth. Each path is assigned with a letter from the alphabet (alephbeth). Often you read about the 32 paths of the tree, this number includes the sephiroth. Also there is the earlier mentioned concept of the ’50 gates of Binah’ which “were necessary to creation” (*Blau | p.56) and are linked with the third sephiroth Binah. This name can be translated as ‘understanding’. The 50 gates are 50 levels of understanding God. Counting their number together with the number of the 22 paths of wisdom, you get another mystical number: 72. Not for nothing Pico had 72 Cabalistic ‘theorems’, it is the number of the names of God which can be drawn from three verses of Exodus. The verses 19, 20 and 21 of chapter 14 have 72 letters each, something that caught the eye of early Jewish mystics. They wrote the verses under eachother (the second in reversed order) resulting in 72 three-letter names of God. From these you can also make the names of 72 angels. The number 72 itself can also be found within the tetragrammaton (Y+YH+YHV+YHVH=10+ 10+5+ 10+5+6+ 10+5+6+10 = 72). Inside and outside Reuchlin’s book we can find more of similar ‘proofs’ of Christian doctrines in Jewish texts. Take alone the highest angel Metratron who was often identified with the Son (first creation, Logos, highest sephiroth, etc. ), but Jews also identified him with God. This last is the conclusion of another Kabbalist letter game called ‘gematria’. The numerological value of the name Metratron is the same as that of the God-name Shaddai: 314. Another Christian play of Jewish origin is the following. The first word of the Hebrew Bible is “Bereshit” (BRAShYT – in the beginning). The word game of ‘notaricon’ says that every first (or last) letter of every word of a sentence gives a word that says something about that sentence. This also goes the other way, one word could be a sentence. In our example “BRAShYT” could be a sentence, for example: “In the beginning Elohim saw that Israel would receive the law”. In Hebrew the first letters of this sentence form “BRAShYT”, so the Bible says that the people Israel receive the Torah. A Christian Cabalist would make another sentence of the same word, for example: “Son, Spirit, Father, their Trinity, complete oneness”. There you have it! Christian doctrines in the Jewish Bible! These plays seemed to have been able to let Jews embrace the Christian faith. It was like getting on the Jews with their own methods. So now I have mentioned the trinity. There is more to say about this concept. Already in 1292 the Franciscan Arnoldo de Villanova (1235-1315) said that there are three different letters in the tetragrammaton which thus represents the trinity. And so Christian Cabalists did their utmost to bring proof of the trinitarian concept in Jewish texts. Pico -for example- said that the first three sephiroth kether-hokhmah-binah represent the trinity, Reuchlin calls God a threefold principle unity and Giorgi found the trinity in the Jewish names of God AHYA (Eheieh which Giorgi identifies with the Father), YHVH (for the son) and ADNY (Adonai for the Holy Ghost). Three other holy names are folded into a trinity by Reuchlin: He (He), Eheih (I am) and Esh (fire). The number three also comes back in the threefold division of the world: elemental, celestial, supercelestial / intellectual. These three can be found in the Heptaplus of Pico, De Verbo Mirifico of Reuchlin and De Harmonia Mundi of Giorgi. Pico says that the first is our black pit of darkness (earth), the celestial is the world of light and in the heavens light and darkness are in balance (*Secret | p.41). Another three: the three souls of the Jews ‘nephesh’, ruach’, ‘neshamah’ which can be compared to the threefold soul of the Renaissance. Giorgi -for example- talks about these three souls in his De Harmonia Mundi. He speaks about the high, low and middle soul in his long poem. The middle soul is the mediator, the breath of life or ruach. The high soul is the divine soul, the immortal neshamah; and the lower soul, the animal soul or nephesh. Some things were consciously or unconsciously not taken over from Jewish Kabbalistic sources or only partly. Unconscious reasons can be that the Christian Cabalists didn’t know the full range of Kabbalistic literature. Another thing is that the sources of the Cabalists weighted heavily on the minds of them. Dan himself writes in his book that 1. the sources of the Christian Cabalists (Recanati, Samuel, Eleazar) didn’t emphasize these elements or even rejected them (Abulafia); 2. Christian Cabalists were more interested in finding Pythagoras, Plato and Christianity inside Kabbala than in Kabbala itself; 3. some concepts didn’t fit very well with Christian doctrines (*Dan | p.65/66). An example of the last point is the Kabbalistic (sometimes downright Gnostic) dualism. Pico had a fairly un-Christian Cabalistic conclusion, being number XIX: “The letters of the name of the evil demon who is the prince of this world are the same as those of the name of God -the tetragrammaton- and he who knows how to effect their transposition can extract one from the other.” (*Beitchman | p. 67). But after this it was mostly done with the dualism of the Christian Cabalists. Other elements that didn’t make it to the Christian Cabalist doctrines were the overtly feminine sexuality of the sephiroth Shekinah and Malkuth and the pleroma of the sephiroth. With later Christian Cabalists things didn’t get any better. Christian Cabalists mostly followed Pico and Reuchlin who already often tapped from secondhand sources. Just a handfull of Christians got to learn with a Jew and learned Hebrew, but often didn’t come much further than the books they learned the language from. It is already hard to say where Jewish Kabbala starts and begins. It involves much more than these few things that I have written about. Take alone the magical side of it. Angel magic, Golems, finding the true name of God for the highest knowledge. Also some Christian Cabalists meddled with magic, often continuing the traditions of pre-Cabalistic natural magic. Other Cabalists didn’t want anything to do with magic and had a theoretical approach (like you have practical and theoretical Jewish Kabbala as we saw earlier). I don’t think anyone has ever tried (or will try) to give all embracing definition of the term Kabbala or Cabala. Still you can see that Cabala (whatever it is) gets mixed with other arts. The most well known is the art of poetry and play. Poetic cabalistic writings such as De Harmonia Mundi and Jean Thenaud’s (?-1542) La Saincte et Trescrétienne Cabala (‘the holy and very Christian Cabala’) inspired poets and play writers like Edmund Spenser (1552-1599) and William Shakespeare (1564-1616) to incorporate Cabalistic themes in their own writings. Other reworkings of Cabala can be found in the works of magicians like Johann Trithemius (1462-1516), Henry Cornelius Agrippa (1486-1535) and John Dee (1527-1608). The first and the last were primary ‘angel magicians’ which is a subject I am currently writing an article on. Agrippa is best known for his compendium of Renaissance occultism De Occulta Philosophia libri tres (‘three books of occult philosophy’ – 1531). In his theoretical work he speaks about “cabalie” in book three (ceremonial magic) which art is quite well written. Also in his defensive writing De Vanitate Scientiarum (‘about the vanity of all arts’- 1526) he shortly gives good information about several arts. Cabala even made it to science. The earlier mentioned Knorr and his friend Van Helmont introduced Cabala to well-known early scientists like Gottfried Wilhelm Leibnitz (1646 – 1716) and John Locke (1632-1704). I will not speak about all this (here). Some of the books below do, some do extensively, so if you are interested. A fact remains that in time the ‘sharp edges’ of Cabala disappeared and some ideas remained in our thinking (without us knowing most of the time) because of sources we never suspected having such a background. Pretty soon after the Renaissance there is not much trace of the Cabala and nowadays Christian Cabala is mostly regarded as a Renaissance phenomenon, while Jewish Kabbala keeps developing until the present day. Blau goes as far as calling Christian Cabala: “a fad of no lasting significance.” (*Blau | foreword). I don’t agree with him entirely and also later investigators don’t agree with Blau negative approach, but it is true that the original version definitely outlived the Christian version. The oldest modern investigation of the Christian Cabala is the book is The Christian Interpretation Of The Cabala In The Renaissance (1944) by Josef Leon Blau. In a way an interesting book, but he has a very negative approach. Blau wrote a nice history with Pico, Reuchlin, Ricci and the like, but completely misses the point on a few subjects. A great bibliography though and a good introduction, but be sure to read more recent works which often build further on this book and but with a less negative approach. In 1958 there was the work Die Christliche Kabbala of Ernst Benz with the revealing subtitle “ein Stiefkind der Theologie” (“a stepchild of theology”) with a nice overview. Nothing smashing, but especially for its time interesting. A very small work is La Kabbala. Kabbala Juive et Cabala Chrétienne (‘the Jewish and Christian Cabala’ – 1977) of L. Gorny. Interesting for being written so early, but not adding much to the later releases. Another quite well known but not too good book is Spanish Christian Cabala of Catherine Swietlicki (1986) dealing only with “the works of Luis de León, Santa Therese de Jesús and Juan de la Cruz”. Swietlicki has also written a few other titles that I haven’t been able to see. A brilliant book that is unfortunately no longer available is as an account of an exhibition and symposium at Harvard University in 1996. The Christian Kabbalah: Jewish mystical books and their Christian interpreters (1997) edited by a student of the late Gershom Scholem: Joseph Dan. The book contains the superb article by Scholem for the first time in English about the origins of the Christian Cabala under the title The Beginnings Of The Christian Kabbalah. Further a great article by Dan himself about Reuchlin, Francesco Zorzi (Giorgi) by Giulio Busi and articles by Klaus Reichert, Allison P. Caudert and Hillel Levine. With enormous distance the best book about the subject which I had the pleasure to read for this article. A third book that I used is the not-too-great Alchemy Of The Word: Cabala of the Renaissance (1998) by Philip Beitchman, but which is the only book that is still available. It heavily leans on Blau (and also Scholem, Secret, Waite and Yates), but disproves many of Blau’s ideas and highly enlarges the information. All in all a helpful book, but it also misses vital points and is not too well written. His Bibliographica Kabbalistica with descriptions of works is helpful, but by no means unique. The Impact Of The Kabbala In The Seventeenth Century of A. Coudert (1998) mainly deals with F.M. van Helmont and his influences and influence. A Frenchman who did groundbreaking work was François Secret. He wrote several books about the Christian Cabala, Paul Ricci, Guillaume Postel, Sabbatai Sevi, Pico and other Renaissance subjects (such as superstition, Mesmer, talismans, literature and alchemy, etc.). Unfortunately all but two are not available in another language than his native one. I found one title in English and one in Dutch. Three titles that I used are Les Kabbalistes Chrétiens de la Renaissance (‘the Christian Cabalists of the Renaissance’ – 1985) and the Dutch Hermetisme en Kabbala (1990) which Secret wrote for an exhibition of our Bibliotheca Philosophica Hermetica and speaks of a great many old and less old works. Lastly another book with a similar title Hermétisme et Kabbale (1992). I own a copy of the Dutch exhibition bundle, which has been very helpful. One of the first academic investigators of the Kabbala was of course the late Gershom Scholem (1897-1982). He wrote mostly about the Jewish Kabbala, but included large sections about the Christian variants in some of his books, his best-known even: Major Trends In Jewish Mysticism (1941) and Kabballah (1978). Even an occultist as Arthur Edward Waite (1857-1947) in his book The Holy Kabbalah (1929!) has extensive sections about Christian Cabalists. The Kabbala Denundata of Knorr (1677+1684 in two parts) partly as The Kabbalah Unveiled by Samuel L. MacGregor Mathers (1887!) which can even be read online . The well-known book De Arte Cabalistica (1517) of Reuchlin is also translated to English by Martin and Sarah Goodman in 1983 as On The Art Of The Kabbala. Rabbi Josef Gikatilla’s Sha’are Orah (1280) has been translated to Latin by Ricci as Portae Lucis (1587) and later to Gates Of Light (1994) by Avi Weinstein. Naturally many more titles are available. For a great overview of these I suggest you surf to the excellent article The Study Of The Christian Christian Cabala by the artist Don Karr which gives virtually all information about articles, books, translations, etc. available. PDF-file. Is the Christian Cabalists about mystical things or magic? It’s closer to magic than to mysticism. See my articles “Angel Magic” and “Christian mysticism” for more in depth information about these two subjects. I think the Christian Cabala survives even in modern times. Perhaps the most recent use of Christian Cabala incantations and rituals as a practical weapon against evil was demonstrated in the novels of the late Dennis Wheatley (British), who I suspect WAS a Christian Cabala practitioner. And, one 1968 film made from one of those novels (The Devil Rides Out … released in the USA under the title, The Devil’s Bride) clearly demonstrates this. In the film, Nicholas, the Duc de Richlieu, uses Christian Cabala incantations and rituals as a weapon against Mocata, an ipsissimus (master of the highest grade in magic) and Satan worshiper, who is trying to steal the souls of two innocent persons. The role of Nicholas is played by Christopher Lee … and the film was one of the last “good” releases from the Hammer Films production company. In any case, I’m wondering if there are any organized Christian Cabala sects existing today. Anyone know who they are and how they might be contacted for further information? I am interested in becoming a christian qabalist.How do i go about it? I don’t know of any organisations, let alone individuals practising. I would start with studying the books that I mention and hope you will run into a fellow student. Kabbalah actually means “reception” not “tradition.” There is no “Christian Cabala,” as it is universal, not limited to Judaism or any other religion. Kabbalah itself is not religion at all. Kabbalistic works predate Judaism; “Sefer Yetzirah” (the book of formation) by Abraham himself being one of the foundational works. Kabbalah is not mysticism or magic(k). It has to do with a more thorough and deeper understanding of life and Torah and the levels of the relationship with the Creator. It is mystical to some because they are not on a level where they can understand it. Rav Michael Laitman and kabbalah.info have an introductory course of Kabbalah that is excellent preparation. There are materials in many languages, including the aforementioned “Sefer Yetzirah” of Abraham. The materials are not geared toward Jews or any other group, although the basis of Kabbalistic materials utilizes the Hebrew language. People of every background are welcomed. I can say that confidently because I am from a Christian background. All of the works of Rav Laitman as well as most important Kabbalistic works are available for free at the website. Hundreds of books as well as thousands of hours of audio and video instruction, as well. May God bless your pursuits. Fred talks about Ray Michael Laitman.His book Introduction to the Book of Zohar: The Science of Kabbalah Pticha.This book could be a help to you. I once had an experience where I could explain it as becoming one with the creator. I did not know of Kaballah then, but only that my soul needed to know the truth. My thoughts during that short period of time were as though they were recorded and then played out in physical reality over the next few years. Even today I tell of this majic dumpster I have, where I think of things and they come to be at the majic dumpster. Its not the dumpster, but only an acceptable media. Where did god come from? before anything at all, before time and space, before existence, before consciousness, what is the unknowable….. but then a split happened and out of it came the conscious awareness of existence. Two things that either are or they are not, existence and consciousness. Both of which can contain content, changing content. Existence with physical content and consciousness with abstract content. But if you are all that exist, how do you know you exist, that you will continue? Grow, expand in both physical content and abstract content and for insurance you create life that is capable of assisting in the expansions. The survival instinct is the primary essence, we all have it, we all know it. Secondary is the primal physical abstract association and third is the ability to build abstractions upon abstractions, to go beyond the primal level of abstraction but through the use of abstraction control the physical. The ten levels are not levels but the ten action constants of abstraction physics. Facets that are fractal recursive and unavoidable in all that you think and do, where proof is found in failure to avoid using these “action constants” – see the wiki at abstractionphysics dot net for more information. There are two modes of operation one being like a programmer creating the program (the mode of creator), the other mode like being the user using the program (the mode of the use of the creations) . Where the skill is in controlling the modes of operation. There is yet to be a correct philosophy teaching of this control that is easy for all to learn and apply and it is here why Cabalah is considered mysticism. Mysticism is in the theoretical teachings, not the actual doing application. I have believed in Sefira for the past five years, and recently I have become a follower of Jesus Christ. Is it safe to say that I am Christian Cabbalist? No worries. I am a Christian Cabalist without the magic. Peace. Many have observed the Gnostic and Kabbalistic tendencies in both Jesus of Nazareth* and the apostle Paul. So perhaps if Bradley is a serious follower he could be said to be a Christian Cabalist. But labels are just labels and a rose by any other name would smell as sweet. Carlo Suares is an excellent though difficult to read source for essential understanding of Christian cabala. See his “Second coming of the Rabbi Jesus Christ” as well as “Cipher of Genesis” “The resurrection of the Word” Works on the Sepher Yetzirah, Song of Soloman, and others. I have been patiently rereading his works for years and they are immensely rewarding. Another very helpful book for understanding the central “Doctrine of the Son” is Leonora Leets’ massive and facinating “The Secret Doctrine of the Kabbalah” subtitled “Recovering the Key to Hebraic Sacred Science”. She makes a convincing case that the “Doctrine of the Son” was and remains the central key to understanding reality but that “The Son” was co-opted by the Christians and so the Jewish Kabbalists had to go underground with it and disguise it with the Arch Angel “Metatron” She points out that much of what we know today as Kabbalah is the oral tradition from the Temple passed down for centuries and which was forced underground by the Roman destruction of the Temple and it’s systematic hunting down of the royal priesthood and kingly lines. Both of these authors are throroughly conversant with modern physics and are profitable to read even if you are not interested in mysticism, magic, or religion. I agree with much of what Fred (above) has to say about the antiquity of Kabbalah and that it is really about understanding “Life and Torah” and yourself. What is this “split” that you mention without introduction or explanation, and from which all your questions arise? August, do you refer to my article or to an earlier comment? Shortly after I posted the above, I discovered another wonderful source on Christian (and Jewish) cabala. Just google ” Work of the Chariot “. Chapter five of their book “The Mystical Heritage of the Children of Abraham” is entitled “Mystical Qabalah, mystical Christianity and the Christian Cabala.” The entire book is invaluable and free to down load.